The ride across town was especially slow this morning, my legs were just plain dead. I had no pop in the old thighs. At first, I was a bit surprised but then a figure it out. The answer is pretty obvious. This past weekend I spent a great few days in upstate NY just a few miles down the road from the site of the original Woodstock. This area is a great and ripe with long winding country roads with CRAZY hills. Naturally, the only thing to do is bring the road bike and carve out at least one full day to head out into the country. With that attitude, the GF and I went out on Saturday. It was a great ride and tons of fun, until it wasn’t. I’m not too proud to admit that we bit off more than we could chew. Luckily, the crew we were with are great people, fellow cyclists and happily came to pick us up about 2 miles short of home base. Normally, I’d be embarrassed I didn’t push through and get it done but I’ve ridden that 2 mile stretch before and it’s the hardest climb I’ve ever done on my bike, it’s one of those stretched of road that you get tired driving up it! Huge thank you’s are in order to Tori and Joel for coming to pick us up and to Stu and Ester for making it all possible. Layne, Meg, Rick, Kayla, Max, Will, Jack, Nora for a great Memorial Day weekend and most importantly to Maura for putting up with me and my antics. I’ve spent a number of these holidays at the house with this crew and no matter how many dogs, kids, random friends and/or wild animals we add to the equation, it’s always SO MUCH FUN! 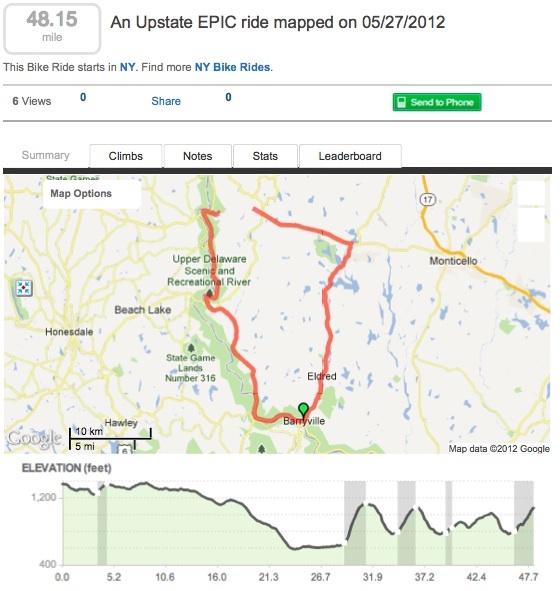 This entry was posted in Bike commute, Car Free, Urban Bike and tagged Cycling, Memorial Day, New York, Road bicycle, Saturday, Sports, United States, Woodstock. Bookmark the permalink.